Laurie Wisbrun sent me some of her upcoming fabric line called Brrr... (it will be available in a couple of months) These are such fun fabrics, with a mix of polar bears and snowflakes and Scandinavian inspired flowers. Somehow these prints were just begging to be paired with black and white, so I added some black, white and grey prints, as well as a few solids. The design was originally inspired by this tea towel. Although in the end it's really kind of different from the original design. I'd like to try this idea again. One thing I'd do differently next time is have the bottom row of triangles sitting right along the bottom. I do like having some white triangles sprinkled in there though, which gives it a bit more of a random look, and the rows not all lining up... yup, i'll be visiting this one again! Those big circles are perfect for the back of a quilt. So bold and fun! And I'll say it again, I think these prints work very well with black and white. I do have a fat quarter bundle of this fabric to give away here one of these days, just want to show you a little something with the other colors yet first. Fabulous! Reminds me of a cold, snowy day! Great job!! I really like the way you did your own thing and spaced out the triangles. That deeper teal was an awesome solid choice too. Love it!! What a lovely quilt. I really like your use of white space on this one. It lends a soothing quality to the quilt top. I love it! Great to see it finished! Love the negative space around the triangles, and that the triangles are unevenly distributed!!! This is the second project I've seen today with triangles and it really makes me want to try them! Love the negative space created by those random white triangles. Beautiful quilt! absolutely wonderful! those prints are stellar and the triangles are perfect! I enjoy the black you added in this quilt. It really helps other colors stand on its own! The white background really balance everything together! Did you happen to cut all in triangles? Thank you for sharing!! I like the way you varied the pattern rather than just alternating white and colored triangles. The white trapezoids really move your eyes across the quilt. Great quilt! The black and white is perfect! I like so much about this quilt! I haven't done much with triangles like this yet so this gives me inspiration. The colorful triangles and white ones work well together. Lovely! I like so much about this quilt, from the fact that the triangles are not all the way to the top, to the missing ones here and there. Fantastic! Cute! I love the randomness too! it is so pretty jolene! i love the randomness of the triangles too! Ditto on feeling the triangle love! Its gorgeous!! lovely! and the random white spaces in the triangle are fab (looks like lots of us are in agreement on that). great quilt! I really love this one, Jolene! All the negative space is so effective. My feeling as this collection plus black/white is really, really on target. Looks great! What a fun quilt!!! It looks fantastic. I love this design, the addition of white triangles, all the negative space, just fabulous!!! THis is totally cute! Very nice. I did a striped binding the other day but did it the other way and so I didn't quite get the same effect. You're absolutely right about the black and white! Love. I would never have had the idea or courage to use black and white with these colours, but they really make the quilt special. Love it and would like to try making a triangle quilt now too. Wonderful design. I have some Reunion fabric that would pair nicely with BRRRRR. Thanks so much for the on-going inspiration. Your blog is so uplifting....Thank you, a million times! Love the design, your right, the black and white look great with the fabric. Love those triangles! This is wonderful! I love the gaps and jags! I do love the colors of this line! However, it's funny to me that it's not going to be available until Spring time. Black and white bindings are the best! That is such a fabulous quilt design! I really like the white and offset ends as you mentioned. It's orderly - and not - at the same time. very nice and the black and white mixed in is perfect! You are a genius. Love the additions of the fabrics that you chose! this is amazing! i love everything about this quilt. it's gorgeous! I like the triangle (trees). Absolutely love the seemingly random triangle groupings. 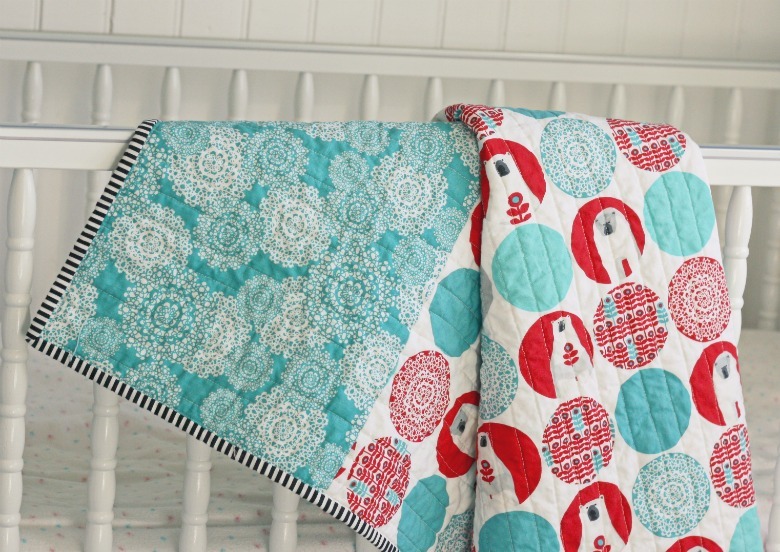 Love the fabric line and the quilt - you're so talented! Great job. I am really excited about this line. 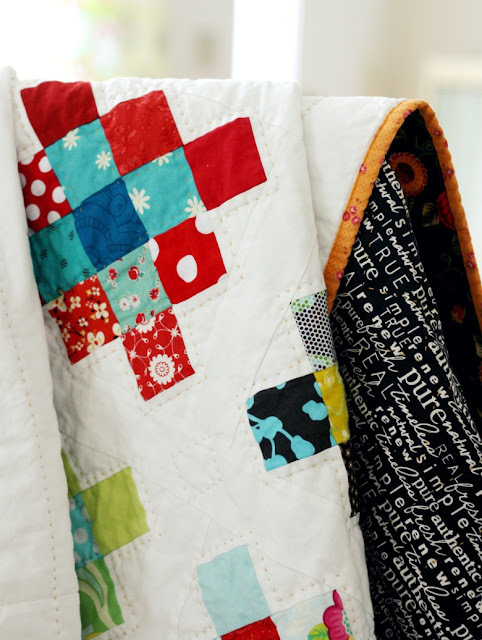 love your quilt like others too! Loving the big triangles. This way you can show off some beautiful fabric! Great job! Love these colors and your choice of pattern. The pictures are wonderful. Thanks for sharing. What fun fabrics and a great pattern! I agree, they do go wonderfully with black and white! And I love that large print for the backing. You have great ideas! Wow, this is absolutely beautiful. May I ask which solids you used? Kona? Which ones if I may ask. They work perfectly with those prints. 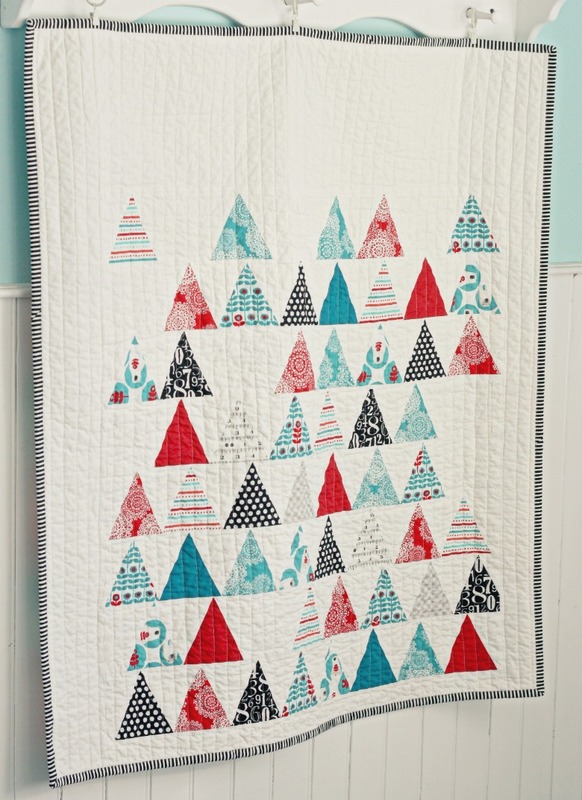 Love your quilt, and am inspired to do a triangle or two myself! Thanks for sharing. Gorgeous! What a perfect way to show off those fantastic fabrics. Love, love, love this quilt. I love the colour way in this quilt and the fabulous design. 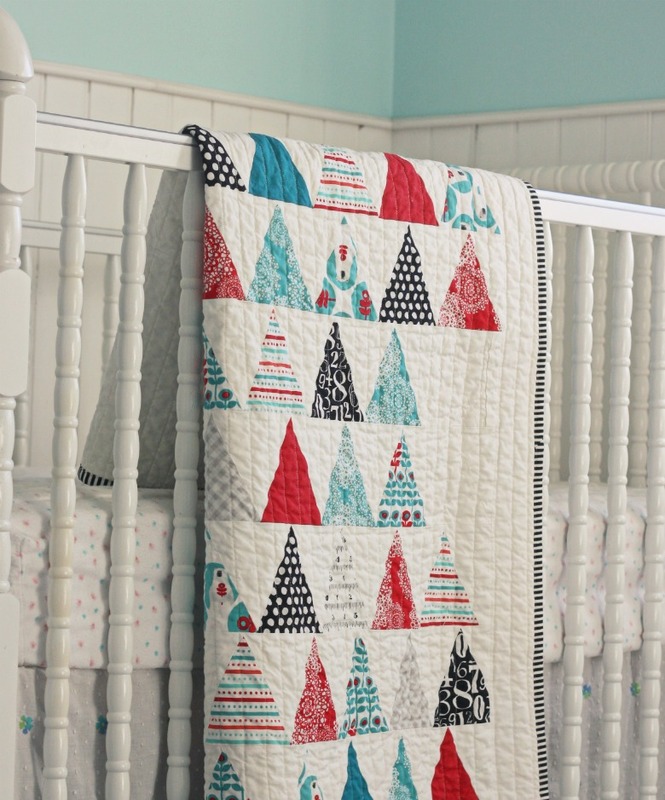 The triangles look beautiful and with a winter theme are perfect. Being doing lots of sqaures and trianges lately, been a few months since a triange graced my cutting mat. Thanks for the inspiration. Absolutely love the colours of this one, really gorgeous. Do you know what size the triangles are and what the finished dimensions of your quilt are? Btw: LOVE the random white space. this is a great quilt! Very nice! I love this quilt! Are the triangles equilateral or isosceles? Some of them look like all of the sides are the same length, but then others look like only two sides are the same length. Do you mind sharing which triangle template you used? I'd love to make a quilt like this.